"Great Falls and Mather Gorge" is the definitive, in-depth look at the spectacular Great Falls area on the Potomac River, including the two adjacent National Parks: Chesapeake and Ohio Canal National Historical Park in Maryland and Great Falls Park in Virginia. What makes the book unique is that it concentrates on just one square mile - a half-mile wide swath along two miles of the river. This wilderness area is a diverse wonderland of river scenery, complete with rare plant life, wildlife, historic structures, world-class whitewater paddling, rock-climbing, and other recreational activities. All of this is easily accessible to people in the Washington, D.C. metropolitan area. Whether you are a long-time visitor to Great Falls or a newcomer, the photographs, map, text, and captions will educate, surprise, and inspire you. 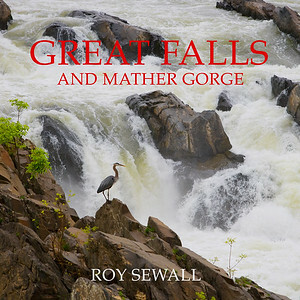 "Although I've visited the Great Falls area frequently for 35 years, I never fully realized the extent of its beauty and drama until I got Roy Sewall's wonderful new book. Combining sweeping panoramas with intimate scenic images, the book is a photographic treasure. In addition, Roy has obviously spent years working with local specialists to discover and present intriguing information on the area's natural and man-made scenery, the wildlife, and the activities. In summary, great photography combined with fascinating nuggets of information." - S.M. "What an accomplishment! I was so impressed by your undertaking and how beautifully executed the project was in the culmination of the book. It showed an enormous amount of work, precise research, wonderful photography of course, and such a depth of feeling for your subject. Congratulations. It's very inspiring. A gift to all of us who care about and spend time on the river and in the gorge. Thank you." - I.O. "You give us a beautiful and exciting perspective on the falls and gorge in their varied dimensions natural and human. It is astonishing how much there is in that mere square mile. It is far more than another coffee table book. It is revelatory." - C.L. "Roy Sewall has created a wonderful photographic depiction of both the Great Falls Mather Gorge area of the Potomac River and the diverse human activity that occurs there. This book is remarkable for its comprehensive coverage of the area with exquisite photographs, its numerous well written human stories of life on the river, falls, cliffs, canal and surrounding terrain, its excellent map, and its contribution to the conservation movement. This book is a definite keeper." - K.M. "The book is absolutely FABULOUS! Beautiful photography! In particular, the kayak pictures are a terrific combination of beauty and drama. I am also really impressed with how you dealt with the myriad natural aspects of the area and the range of ways in which people interact with it all. Congratulations on a truly stunning book." - M.M. "The book is fabulous! We love it! Both books are on the coffee table in the family for us and our visitors. Such a beautiful pallet of colors and creativity!" -S.N. "Great book! Of the quality that we are used to from you. Really, really, really nice ... thank you, thank you, thank you." - E.W. "Your book rocks! Thank you so much. It currently has a prominent place next to my sofa." - J.C.